Christmas in Sweden is strongly correlated with a couple of traditional candies. Most would agree that Christmas is incomplete without knäck, ischoklad and pepparkakor. Merry Christmas everyone! Click the images to get to the recicpe! Fudge is not the most typical Christmas candy since it is also quite common around the year. There are countless different flavours for fudge, but for Christmas we thought gingerbread was the most suitable. No Swedish Christmas is complete without Knäck! 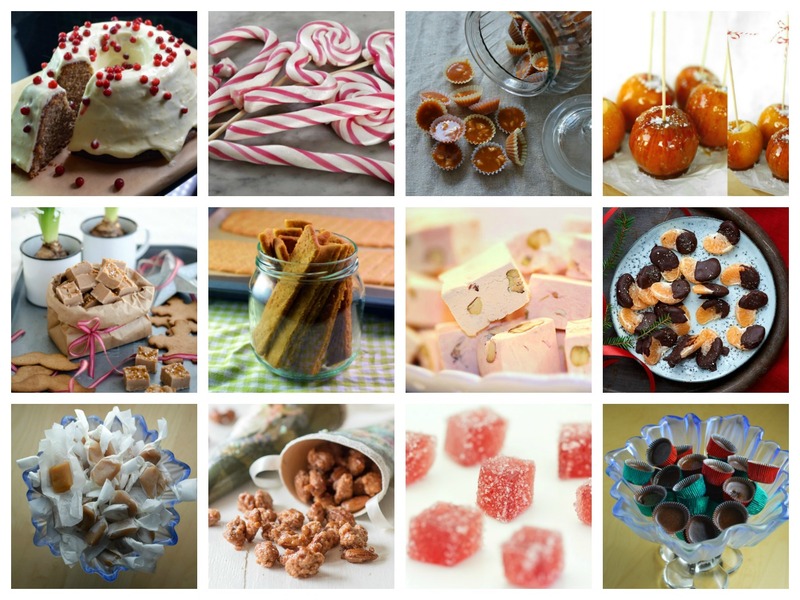 Together with ischoklad (ice chocolate) it is the most typical Christmas candy in Sweden. I don’t know the correct translation for it, but I guess Swedish Christmas Toffee or Swedish Christmas caramel. The texture varies depending on how high temperature the mixture reaches before you take it off the heat. A typical holiday treat in Sweden is called “smörkola” (or just “kola”). Explaining it in English would result in something like this: chewy goeey caramel candy. Also similar to toffee, butterscotch and fudge. Schorched almonds or candied almonds is commonly found on Christmas tables or Christmas markets in Sweden. The almonds are first peeled, then fried with sugar while stirring. This is also a common street candy in Sweden. Sticky, soft, sweet and with some nuts in. What not to like with this Christmas candy!? No Swedish Christmas is complete without Ischoklad! Together with knäck (Swedish christmas toffee) it is the most typical Christmas candy in Sweden. The original recipe for ischoklad is in my mind a bit boring with just chocolate and coconut butter. In this recipe I used orange flavoured chocolate bars, a tsp of Cointreau and then a raisin or two in each. One of my earliest memories of Christmas candy is going to Christmas markets in December. I especially recall those delicious cubes of sweet marmalade confections! So simple, yet fresh and delicious. Chocolate and Clementine really is a good flavour match. Kolasnittar (Swedish caramel cookies or biscuits or shortbread) are some of the easiest and fastest sweet things you can bake! Now when we enter the christmas season I wanted to try out a slightly different version: saffron caramel cookies! It turned out that saffron in combination with caramel was really delicious. Let me know if you see a confectionary without marzipan figurines in Christmas times, I don't think you'll find one in Sweden! It is a real fun activity with kids to create your own marzipan figurines and get into that holiday spirit. This is also a strong childhood memory from Christmas. Besides being a sweet treat it can also be used as decoration! Definitely more common to just buy ready made. But if you make some yourself you can shape them the way you want!